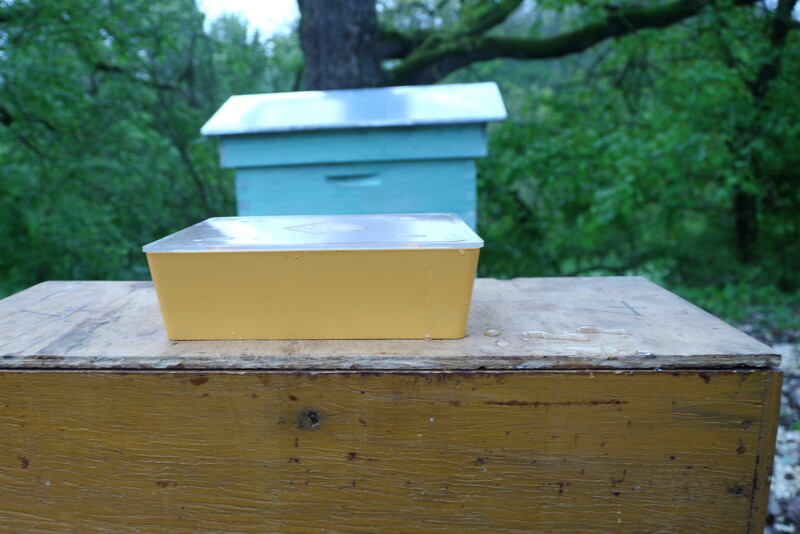 After the recent Queen Drama, it is paramount that the bees feel at home in their new ruchette and stay put. So the following day, I was up with the larks to serve them breakfast – a syrup solution, made with 1 kilo sugar to 1 litre water, and a teaspoon of vinegar – to be served in a feeder which sits over a hole in the cover of the ruchette (which I now understand is called a ‘nucleus’ or ‘nuc’ in English – thanks to Emily : http://adventuresinbeeland.com/). 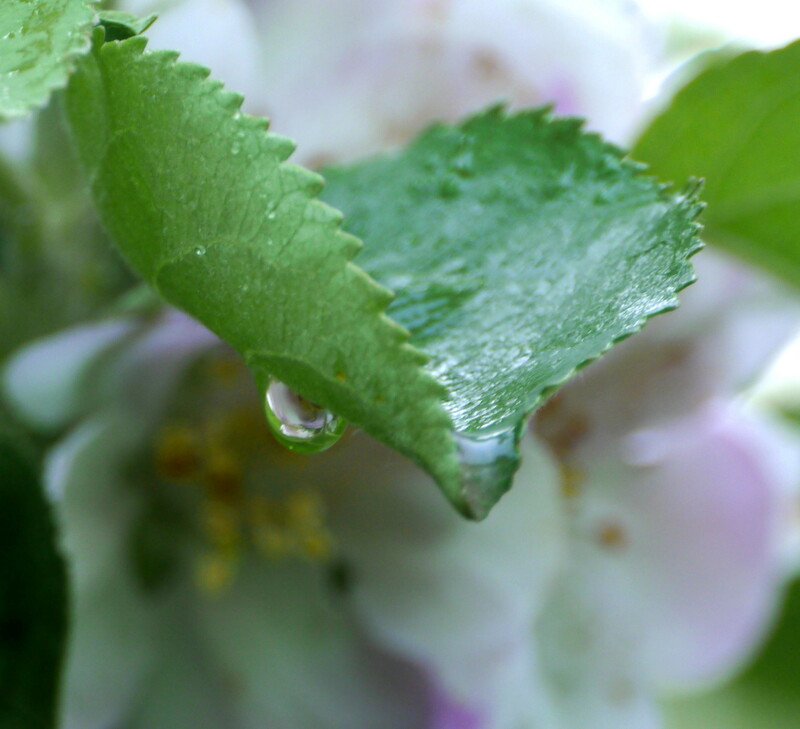 I’m keeping a close eye on the level of this syrup – but am noticing, now that the weather has picked up that there is plenty of coming and going from the ruchette – I will give them a couple more days and then have a closer inspection. Now that things have calmed down, its time to reflect on why the bees swarmed, was it preventable, should I have picked up on clues beforehand that this was likely to happen? The Venerable Beede (VB) assures us that it is quite normal, and may be linked to the weather, in that there have been some hot, sunny, good-foraging days, but lately lots of fresh and unseasonably wet days. Is the pollen being washed away? 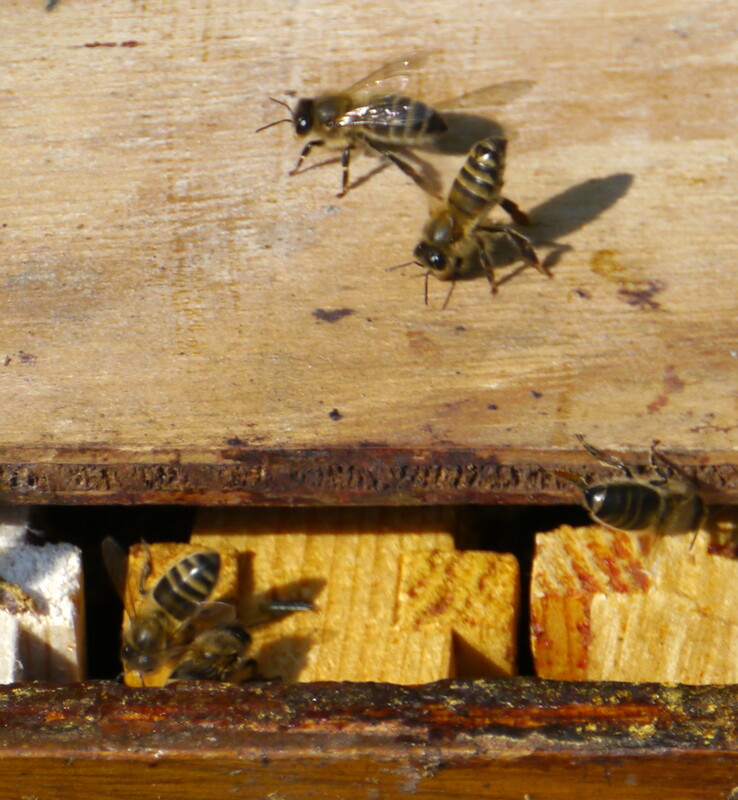 Jean-Philippe, having just returned from his travels, called us yesterday to report that his bees too had decided to split, and a swarm cluster was building in exactly the same manner as mine. Being experienced in such matters, we dashed down to offer any assistance necessary. In the above image, we see a bee sticking its abdomen up in the air, almost vertically, to release the Nasonov pheromone. This pheromone is used by scout bees to mark their chosen new home after swarming and assists the swarm in arriving gracefully at their new location. Not particularly ladylike, but good to see. That photo of all the bees outside your nuc looks fantastic. Our swarm still doesn’t have that many bees and it’s 3 1/2 months old (which is why we requeened). 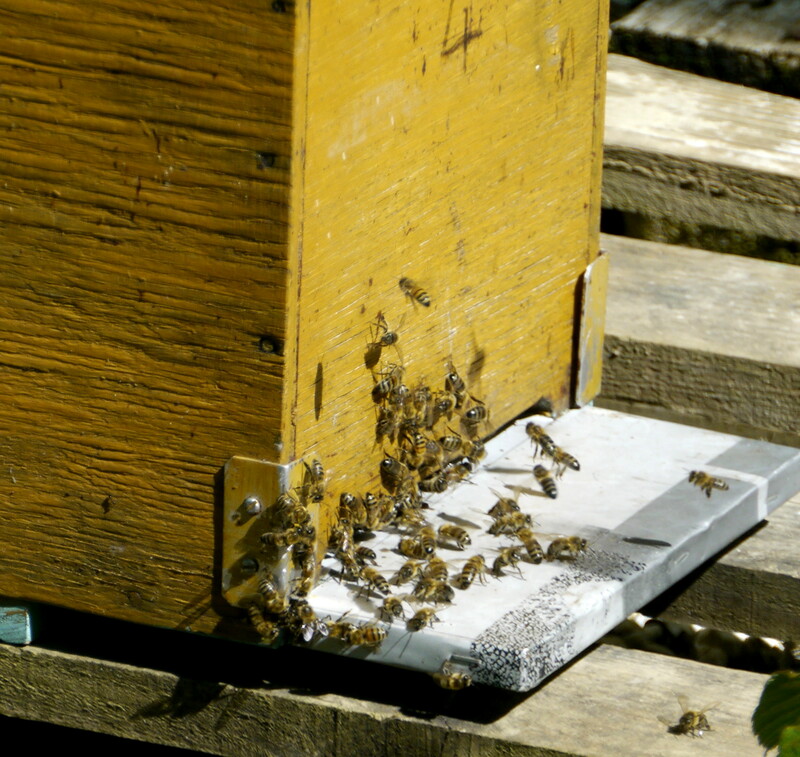 Citric acid is added to the sugar solution to mimic honey which contains inverted sugars. Table sugar is pure sucrose, when heated and mixed with an organic acid (citrus, vinegar, or tartaric acid) it makes some of the sugar go through an inversion process (i.e. inverted sugar) which is easier for the bees to digest. I have further read that apple cider vinegar seems to be the vinegar of choice – and that lemon juice will also do the trick. It’s wonderful to have someone with such a vast amount of experience. Thank you for the link and information. I will read up a bit on it and consider it for my syrup batches. Do you switch to 2 parts sugar, 1 part water in the fall? If so, how much vinegar do you add then, if any? 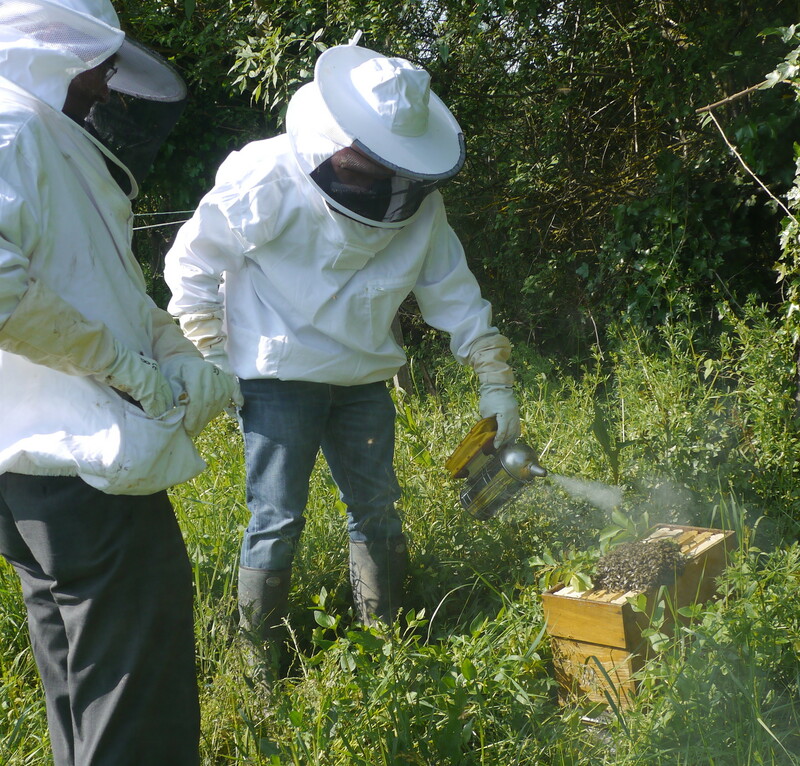 We started beekeeping just a year ago, and so have had only the one winter – and last year they had plentiful homemade supplies – the hive remained heavy for the duration.